Orcas Island has long been rated as one of the best island getaways in North America, and rightly so. Beautiful state and local parks offer family friendly opportunities to see and experience the beauty and bounty of nature. Hiking is one of the most popular tourist attractions on Orcas, and is often combined with picnicking and swimming at one of the lake loop trails in Moran State Park. Camp sites and resort cabins provide the full range of country leisure for short vacations or extended tours. Marine tourist attractions are equally prevalent. 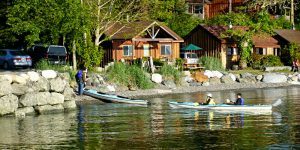 Boaters often stop at Orcas for day visits, or to stay at one of the island’s classic waterfront resorts. Bikers and motorists can choose from quiet country inns, or head into town for more familiar hotel accommodations. Marine adventure options continue with whale watching and charter tours that circle Orcas and run all over San Juan County. Kayaks can be rented, with the support of professional instructors, from several waterside locations. An affordable, quality, consignment shop for guys and girls of all ages! Jeans, dresses, shoes - brand names & vintage - a little bit of everything! Guided Sea Kayak adventures & boat charters. Located at the Orcas Ferry Landing. Bike rentals, guided tours, sales & parts. Bicycle sales, rentals, and repairs. Centrally located in Eastsound with expert mechanic services and friendly island-touring advice. Ride More, Drive Less, means more fun! Personal and regular daily kayak tours. Custom cruises through Canadian waters as well as whale watching and fishing available. Salmon, Halibut, Longcod, and other bottom fish for a great San Juans fishing experience with all the latest fishing and safety gear. 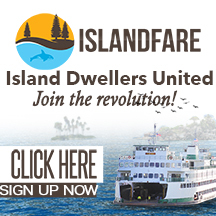 The San Juan Island Chamber of Commerce welcomes you to San Juan Island, Washington. 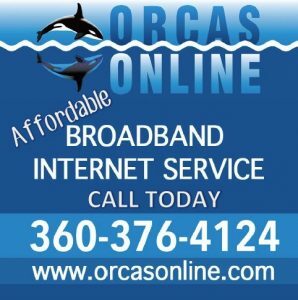 Visit Lopez Island Chamber of Commerce for information and activities! Turtlehead Trails offers private guided horseback rides & lunch rides which can include swimming &/or hiking, depending on preference. Turtlehead Trails also offers a half day & full day Horsing Around Program for children aimed at teaching basic horsemanship skills. In addition, private lessons are available for children & adults. We are a private, walk-in campground on 80 wooded acres 5 minutes walk north of Eastsound and beaches on beautiful Orcas Island. Full gauge antique railway on a 2-mile track, petting farm perfect for families. Wooded campsites are scattered throughout the back of the property, and meadows throughout the front where kids can run and play. The Lobby is stocked with outdoor lawn games, puzzles, books, and board games. The campground is walk-in only, we do not allow cars beyond the Lobby, so kids can play safely. We rent camping gear or bring your own. All tent rentals come with bedding, which includes sheets, pillow, a down comforter and a comfortable 4" foam sleeping pad or a queen sized bed. Also available for rent: camp chairs, hammocks, dinnerware, and butane stoves. Ice and firewood are for sale in the office. Lakeside camp and RV sites, restrooms, showers, drinking water, boat launch, and hiking trails. Stop in for a Orcas Island Map & Guide and detailed island information! 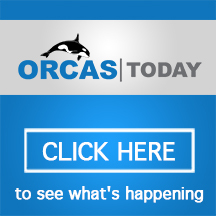 Offers first-class movies on the big screen; the only Video Theatre on Orcas. Bring the whole family or group. Dawn to dusk golf in the San Juan Islands, Orcas Island Country Golf Club offers daily fees, excellent club rentals, power or pull cards, practice area, lessons available. Boutique, snack bar and fully stocked pro shop. Encompassing the Turtleback Mountain, Turtleneck, and Turtlehead Preserves. Features hiking trails which provide access to scenic views of Waldron Island, Deer Harbor, and Mount Constitution. The various preserves are managed wholly or in part by the San Juan Preservation Trust and San Juan County Land Bank and plans are underway to merge all three Preserves into single jointly managed preserve. Come ride with us in Moran State Park an old growth forest with fun trails to meet your needs whether you're a beginner or experienced rider. We offer 1 1/2 hr, 2 1/2, 3 or 3 1/2 hr trails for you and your family. No experience necessary, we will give you brief tips before your ride. Come and experience this beautiful old growth forest horseback. Riders must be at least 7 yrs of age to ride. Call now for reservations: 360-376-2134. 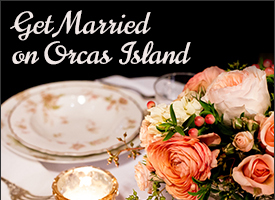 Enjoy the amenities of Deer Harbor - fine dining, elegant lodging, boating, biking, whalewatching, fabulous bird watching opportunities & much more await you in beautiful Deer Harbor on Orcas Island. Campsites, toilets, and moorings as well as beach walking and hiking opportunities. Features concerts, plays, art exhibits, and childrens' events year round.